If there is one widespread misconception about success, it’s that you must always be doing something to be successful. We hear things like, “Stay busy!” or, “Keep grinding.” This is B.S. Not only is such advice toxic, but it is also blatantly false. In economics: Roughly 80 percent of the global gross domestic product is owned by 20 percent of the population, and 80 percent of U.S. federal income taxes are paid by the top 20 percent. In public health: 80 percent of all workplace injuries are caused by 20 percent of the hazards. Additionally, 80 percent of all healthcare resources are used up by 20 percent of patients. In business: In many workplaces, 80 percent of total sales come from 20 percent of clients. In a more abstract example, it is said that 80 percent of all work outcomes are products of 20 percent of time spent. Another way of putting this is that 80 percent of an 8-hour day’s total productivity is realized in roughly an hour and a half! So, the Pareto Principle conveys the critical truth that a disproportionate amount of many outcomes can be achieved by a relatively small amount of input. When it comes to being successful, the Pareto Principle has utility – including in how we spend our time, and, just as important, how we don’t spend our time! In this article, we’re going to discuss some things you should simply never do if you want to ensure success for yourself. You read that right! Just by not doing certain things, you can become more successful or – at the very least – increase your odds of success! 1. Stop seeking pleasure and start looking for purpose. The individuals who make life all about pursuing pleasure and avoiding pain will probably find that they experience more of the latter. For the vast majority of successful people, their situation did not come about without a good deal of sacrifice (read: discomfort). In the context of happiness and success, this means long hours, sleepless nights, and “missing out” on things that would do nothing but distract them from their ultimate goal – the fulfillment of their purpose. 2. Stop mindlessly perusing social (and other) media. Social media has its usefulness, but we’re quickly becoming slaves to it. Instead of keeping in touch with family, many people seem to live for posting about every meaningless thing that occurs. On a macro level, American adults are spending 11 hours per day “listening to, watching, reading or generally interacting with media.” In the context of this article, such vociferous consumption of media is a massive distraction – and no one becomes successful by turning into a mindless drone. 3. Stop imagining painful outcomes. Negative rumination is a byproduct of not wanting to be where you’re at – in the here and now. Worry always involves thinking of the past or future. Of course, success and fulfillment are byproducts of paying attention to what must be done in the present. Your time would be much better spent by directing your focus towards the things that will help you become a successful, fulfilled person. 4. Stop any and all procrastination. Here’s the thing about procrastination: the “pain” that is caused by putting something off is worse than actually doing it! Read that again. The human brain has a weird way of catastrophizing just about everything. Such a tendency can make it difficult to start (and finish) work that needs to be done. If not checked, these innate responses can thwart efforts to better your situation. 5. Stop needing to be right. You’ll notice, as you read through this article, the numerous ways in which ego can sabotage your life. Fear, worry, rumination, procrastination … all of these are the ego at work. The insistence on being right is another sign of identification with ego. Trying to prove yourself right is nothing but a waste of energy and time. Instead, use this energy and time to accomplish something. 6. Stop trying to be a hero. Look, it’s terrific if you’re willing to help others. In this day and age, heaven knows that we need people like you now more than ever. The thing is that such benevolence should come with a feeling of fulfillment – or, at the very least, the absence of regret. If it doesn’t, it may be a good time to reconsider your priorities. Are you living the life that you want? 7. Stop worrying about the future. In Buddhist traditions, followers are encouraged to meditate on impermanence – the fleeting nature of existence. What does this have to do with success? First, it encourages examination of the word “success.” What is success to you? Is your interpretation of success conducive to your values? Second, it reminds us that life is short and that we’re more likely to find true success in the present moment. 8. Stop the comparison game. 9. Stop focusing on the wrong things. Are you honestly doing what you want to do? In other words, are you doing what’s needed to live a genuinely successful life? If not, could it be that you are focusing too much on the wrong things? Are you devoting time and energy to things that make you no better off as a person? Think about this for some time. 10. Stop the incessant mind chatter. 11. Stop being caught off-guard by others. This one is all about not allowing other people to dictate your happiness and success. It’s all about drawing the line with those who need it and, if required, cutting them out of your life. If true success is desired, you must be willing to let go of those who are holding you back. Furthermore, do not tolerate behavior that is directed against you without cause. 12. Stop being a slave to bad habits. Habits form a big part of our life. Consciously or unconsciously, habitual thoughts and behaviors impact most of the decisions that we make throughout our day. Bad habits can be an impediment to success and must be dealt with appropriately. 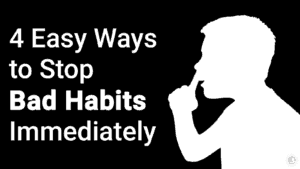 Learn how to form good habits and get rid of bad ones. 13. Stop being a busybody. Marcus Aurelius said it best: “Do not waste what remains of your life in speculating about your neighbors. Anything that distracts you from fidelity to the ruler within you means a loss of opportunity from some other task.” Anything and everything involving gossip should have been left in the high school that we all left a long time ago. Speaking of Marcus Aurelius, he also said, “You have the power over your mind – not outside events. Realize this, and you will find strength.” Too many people underestimate the power of the mind in accomplishing their goals. Moreover, allowing distorted ideas about who you are to derail the route to success is tragic. Understand your capabilities and work on your weaknesses. 15. Stop the feelings of failure or regret. Nothing good can come of replaying your shortcomings on that video player in your mind. We all fail and we all have regrets. The only difference is what we choose to do about them. Will they hold you back or drive you forward? Start making new memories and building toward a more positive future.